It’s not my fault that I’m very, very particular about how my music sounds. My dad was an audiophile who originally owned a record store and moved on to own radio stations. He’d build speakers for our home from scratch, going to Acoustic Research in Cambridge, MA for the very best parts. And then fishing through walls and floors to wire for whole home audio. These were large, stage/concert quality speakers and wow, it was magnificent even though I wasn’t allowed to play rock and roll or folk music. When I started equipping my own home for music, many, many years later, I started with some Bose bookshelf speakers in one room and then a 5.1 system of speakers from Cambridge Soundworks through a home receiver/home theater setup. But still only in one room/one floor And then, along came Sonos with whole home audio. I listened to Sonos Play 5’s in a showroom and was hooked. And of course everything was going digital and online streaming services were just starting up and I signed up for Pandora. I ripped my existing CD collection to digital and starting working on doing the same with my dad’s vast collection of vinyl. With Sonos Play 5’s paired up on 2 floors, I had whole home audio (the master bedroom shares air space with my loft home office and a cathedral ceiling covers both). I’d been thinking about getting a pair of Play 1’s for the bedroom for a while and didn’t pull the trigger as I started hearing the rumors of an Alexa powered Sonos speaker. I’d been using an Echo Dot in the master bedroom, sometimes connect to a Bose Soundlink Mini II (which I mostly use outside on my deck in the summer). 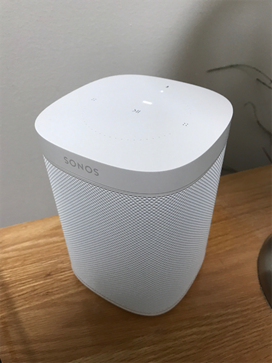 So, I when launch day arrived, I grabbed two white Sonos Ones. And then the first test, “Alexa, play Adele in the Bedroom”. Oh yeah, shuffling Alexa from Prime Music (where I have some playlists) and oh yeah, what great sound. A stereo pair really fills the room and while some complain about not having thumping base, for me, the balance is perfect. My music taste is pretty eclectic and ranges from Opera to Rock, to Blues, to Folk, to Jazz and to Classical. There is one negative about Sonos that I feel important to call out. Since Sonos still (obstructively) relies on the dangerous SMB1 protocol for streaming from local Windows computers to Sonos speakers, I’ve moved to a DLNA based Twonky Server on NAS for streaming my huge collection of ripped music. Sonos really should be ashamed of themselves for not addressing this. Alexa, What Can You do on Sonos One? There are only a few Alexa skills that I’ve found that don’t work on Sonos One. You can’t make and receive calls (but for my usage, being able to make and receive calls on Sonos is not something I need, and I do have an Echo Show in the kitchen). On the other hand, I do like to call up my Flash Briefing when I get up and currently when I ask Alexa for my flash briefing on Sonos One, there is silence. I’ve been told this is a known limitation and being looked into. An Internet search turned up this Sonos thread on non working skills where after reading through all the posts, it seems that only Sleep Sounds is called out by name as not working along with the Flash Briefing. I’m not concerned about the sleep sounds skill since as an Amazon Prime subscriber there are plenty of Sleep Sound playlists that work just fine if I ask Alexa to “play a sleep sounds playlist in the bedroom”. Edit: Working as of November 30! But all the other Alexa skills that I currently use are working and I’m a very happy camper. Compared to using an Echo Dot and a connected speaker, well, for me there is no comparison. Sonos One rocks. So I wasn’t invited to the Logitech Harmony Ultimate Alexa beta and I have some concerns about how Sonos activities are going to be handled with respect to Alexa’s voice recognition. It isn’t exactly transparent how to add/configure the Harmony->Sonos->Smart Things->Alexa routines to start Playlists or Stations from your Sonos favorites after you’ve done an initial setup. You have to roll up your sleeves and get a little dirty. When you edit your Sonos favorites in any official Sonos App (add/remove, etc.) the Harmony App/Remote doesn’t necessarily reread the Sonos lists. To get a revised Sonos Favorites list to refresh for Harmony, you need to START a Sonos favorite, hit the star key on the bottom of the app, then scroll and hit REFRESH. 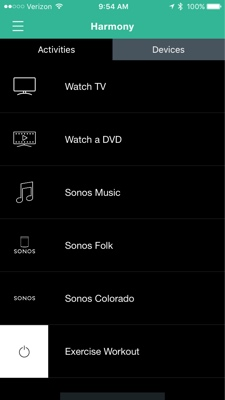 Then you can edit that activity and select a new channel or add Activities and specify a Sonos favorite from the refreshed, up to date list. Below is a screen shot of the first “page” of (scrollable) activities. The naming convention is something I’m working on, and I’ll explain a little further along in this post. Ideally, I should be able to use the same Activity Name across the board, but this turns out to be problematic and confusing. Earlier this week I started a quest to include my Sonos speakers in my Connected Home in order to control them and action music with my Amazon Echo. I found a “wow” solution for DLNA control using JRiver Media Center and a powerful Alexa skill called House Band. What was missing was a way to summon and play my cloud based streaming stations using Alexa’s voice control. Last night I found a great solution in the Yonomi App (available for iOS and Android) that just this week added Alexa integration. I’ve got a bunch of streaming stations configured in Sonos and all are added to my Sonos favorites. I’ve got Pandora Radio fav’s, Amazon Prime Stations, Tune In Radio, plus some of my own local playlists. Yonomi works using routines that you can set up based on time and/or location, but you don’t need to make routines dependent on those criteria, you can just set up a routine that you can summon on demand, and once you hook up via the Smarthome menu on the Echo App, Alexa can TURN ON (routine name). Magic. I’ve had my Sonos Play 5’s since 2010 and started my Insteon Connected Home in 2012. And now, I’m happy to say that Insteon has made it possible to incorporate Sonos speakers in my little connected world. 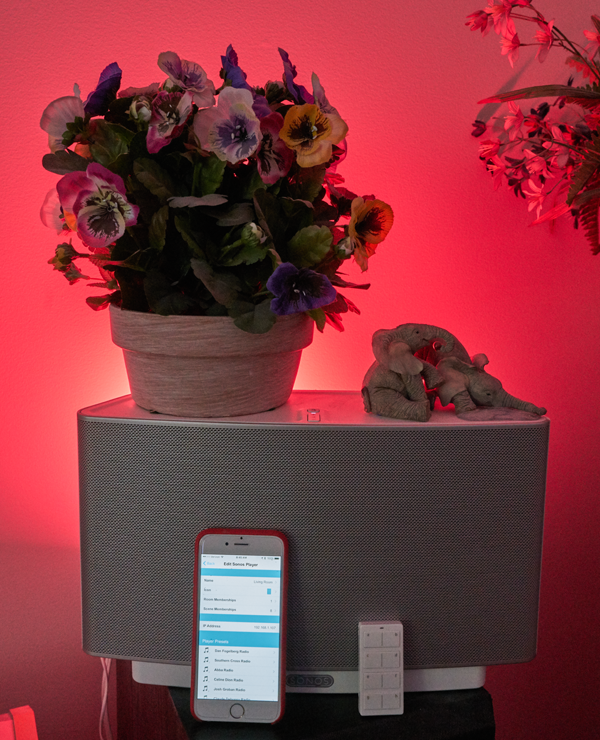 As announced at CES 2016, Insteon integration makes it possible to incorporate music into your Insteon scenes, control scenes and playback via keypads, mini remotes and more, and use the Insteon App to control speakers. 1. The ability to stream from ANY of my computers (using Play To or anything else) to more than one music player/renderer simultaneously. 2. To be able to control the volume above individually or together. 5. Use iPhones, iPads and iPxxx whatever to control and manage the device as a remote control (including graphical menus). 8. A system that was upgradeable. I’m still stunned that I found a system that does ALL of the above. (And I’m betting I discover more features – I’ve only had a few hours experience with this all, so my exploration and discovery has only just begun).